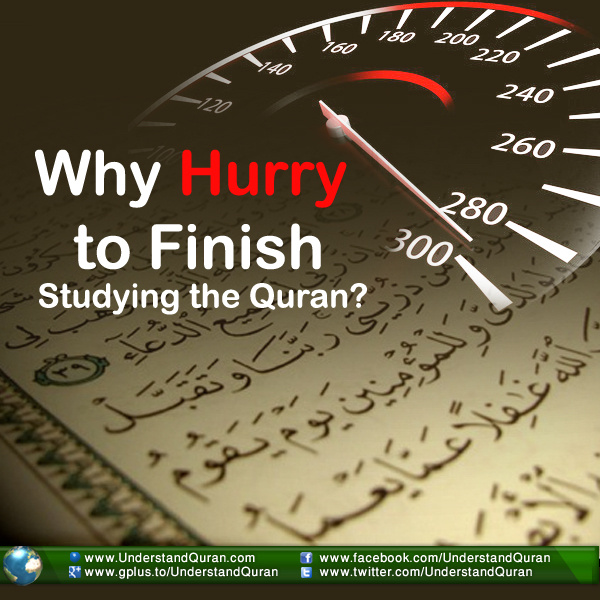 Why Hurry to Finish Studying the Qur’an? Understand Al-Qur'an Academy > Articles > Why Hurry to Finish Studying the Qur’an? What a surprising question, especially coming from a Muslim! For years we’ve been talking about the importance of understanding the Quran as one of the most urgent demands of the Quran itself. We’re already late. How long are we going to put off reading it? If I told my masters students to remain for another year or two to complete their theses, they’d be pretty upset. They’d say: We have to graduate soon so we can go find jobs! We need to use our knowledge to earn money, get married, settle down, and begin our lives! The problem is they don’t know when they’ll die. If we study this book at a snail’s pace (at one page a week it would take us about twelve years) or put it off until we have lots of time to study it, how are we going to live our present lives in full Quranic light? Just like the students who need to use their knowledge to build their livelihoods, we need the light of the Quran in order to truly live. Our first goal should be to try to finish reading the Quran at least once. We shouldn’t stop there, but our first goal should be to read it once to learn how to live our lives according to the words of Allah (swt). Which Name of Allah is This?